Good time of day to you my chess friend! This is Grandmaster Alex Yermolinksy, two-time U.S. Chess Champion and winner of numerous tournaments, including the World Open on three occasions. 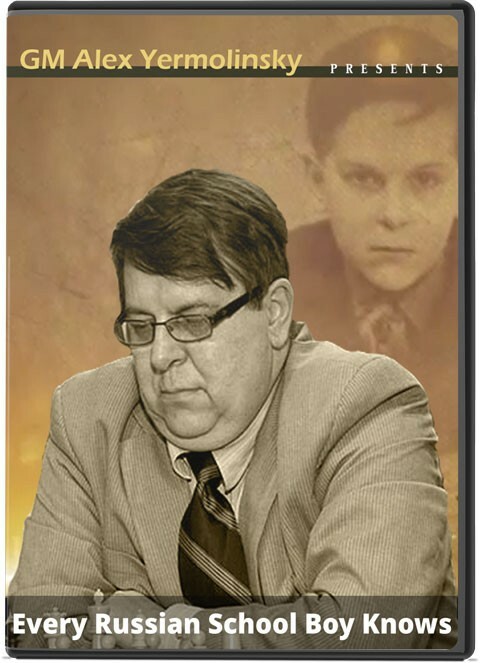 Now you can benefit from my expertise with a super compilation of my best chess videos from my weekly show: Every Russian Schoolboy Knows (ERSBK). This collection contains over 43 hours of my best instruction! Since 2011, I have been holding the ERSBK show on the Internet Chess Club, offering game analysis “Russian style”, providing valuable insight into many aspects of the game, with several miniseries on openings, middle game play, and plenty of endings, which is at the heart of this series. In this package, what you’ll find is a compilation of my best material. I hand-picked the most valuable and instructional videos produced over the years (2011 to 2015). You’ll be able to watch me unravel the many endings that players must know: Rook endings (5 videos), Opposite color bishop endings (4 videos), Same color bishop ending (4 videos), Pawn endings (5 videos), Bishop vs. Knight endings, and a lot more. You get over 43 hours of my best chess instruction! Follow the series through the years, as I go over great material in the opening too, in particular my favorite King’s Indian Defense! There’s plenty of middle game material too, from positional queen sacrifices to how to play with the bishop pair. I have decades of experience as a player, and I think you'll agree that my animated and unique style of instruction will help you improve and find better moves at the board. Relish on this series of his my best content since 2011 and emerge a much better player at the end of it!